Eleven years ago, Deb Perelman started SmittenKitchen.com to collect her favorite recipes. Since then, she has built a community of avid fans who rely on her recipes and her responsiveness in the comment section. She also published The Smitten Kitchen Cookbook, an instant bestseller in 2012, and started a web series on the Food Network. Now she’s back with Smitten Kitchen Every Day: Triumphant and Unfussy New Favorites. 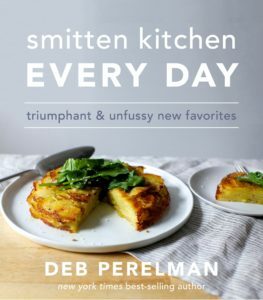 Packed with over 100 recipes, Smitten Kitchen Every Day brings us more of Perelman’s trademark accessible and delicious dishes. Among them: a Kale Caesar; Everything Drop Biscuits with Cream Cheese, and Sticky Toffee Waffles. There are apps, snacks, and party foods; savory and sweet breakfasts, and plenty of vegetarian and meat main entrees. Perelman also provides adaptable, one-bowl recipes for cakes and frostings to avoid Pinterest fails and other baking pitfalls. With Smitten Kitchen Every Day, Perelman brings joy into our kitchens and transporting us through our food to favorite locales, memories of vacations past, or just across the room to the table with friends and family, laden with food that makes everyone happy. In conversation with Sally Swift, co-creator and Managing Producer of The Splendid Table. Book signing to follow.